The history of Sweden's Quicksand Dream is spotty, and that's no mere understatement. Formed in 1988, they quickly spilt some five years later. 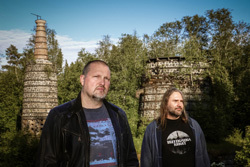 Then they reformed in 1996 with guitarist Patrick Backlund and vocalist Goran Jacobson at the helm. 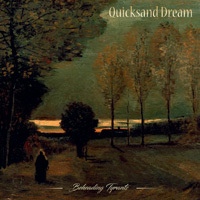 Yet Quicksand Dream basically existed as infrequent creative outlet. It would not be until 2000 when they would release their first album, Aelin - A Story About Destiny. Now make a major sixteen year leap, and Backlund and Jacobson return with Beheading Tyrants. Nearing an EP in length, it offers six songs in about 33 minutes. Now, as usual, I don't read press material, bios and such, until I've listened to the album and prepare to write the review. My first reaction to Quicksand Dream was that I warped back some 30, even 40, years, to old school heavy metal, perhaps on the epic or even slight doom metal side. Think Manilla Road or Cirith Ungol. Perhaps better, for some 21st century examples, consider Germany's Atlantean Kodex or Philadelphia's Sumerlands. Musically, one of the very first things I noticed was the presence of strong, and leading, bass line from Backlund. Following this is an abundance of inspired and soaring guitar work. Whether by acoustic or electric, riffage to leads, the guitar presence is formidable and satisfying. Typical of the epic heavy metal style, the vocals, though clean and melodic, are lightly muted. Pacing can vary from the doomish sluggishness of White Flames On Black Water to the brisk power metal pace of The Girl From The Island. Fundamentally, if you like any of the band's I mentioned or simply enjoy classic old school heavy metal with a bit of epic and doom metal from Candlemass or Manilla Road, you will want to get this short album. Recommended. Fundamentally, if you like classic old school heavy metal with a bit of epic and doom metal from Candlemass or Manilla Road tossed in, you will want to get this short album. Recommended.